Catalin George Festila: Using the python module music21. Catalin George Festila: Using pytineye to automate searching for images. The author selected the Tech Education Fund to receive a donation as part of the Write for DOnations program. Docker is an open-source application that allows administrators to create, manage, deploy, and replicate applications using containers. Containers can be thought of as a package that houses dependencies that an application requires to run at an operating system level. This means that each application deployed using Docker lives in an environment of its own and its requirements are handled separately. Flask is a web micro-framework that is built on Python. It is called a micro-framework because it does not require specific tools or plug-ins to run. The Flask framework is lightweight and flexible, yet highly structured, making it preferred over other frameworks. Deploying a Flask application with Docker will allow you to replicate the application across different servers with minimal reconfiguration. In this tutorial, you will create a Flask application and deploy it with Docker. This tutorial will also cover how to update an application after deployment. A non-root user with sudo privileges configured by following the Initial Server Setup with Ubuntu 18.04 guide. One Ubuntu 18.04 server with Docker installed, set up by following this tutorial or with the DigitalOcean one-click Docker image. 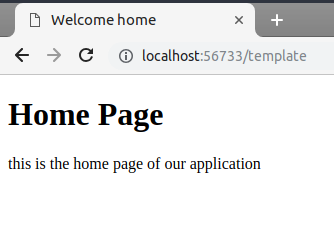 Nginx installed by following step one of the How To Install Nginx on Ubuntu 18.04 tutorial. To get started, you will create a directory structure that will hold your Flask application. This tutorial will create a directory called TestApp in /var/www, but you can modify the command to name it whatever you’d like. The -p flag indicates that mkdir will create a directory and all parent directories that don’t exist. In this case, mkdir will create the app parent directory in the process of making the static and templates directories. The app directory will contain all files related to the Flask application such as its views and blueprints. Views are the code you write to respond to requests to your application. Blueprints create application components and support common patterns within an application or across multiple applications. Now that the base folder structure is complete, create the files needed to run the Flask application. First, create an __init__.py file inside the app directory. This file tells the Python interpreter that the app directory is a package and should be treated as such. Packages in Python allow you to group modules into logical namespaces or hierarchies. This approach enables the code to be broken down into individual and manageable blocks that perform specific functions. Once you’ve added that code, save and close the file. With the __init__.py file created, you’re ready to create the views.py file in your app directory. This file will contain most of your application logic. from app import app  @app.route('/') def home():    return "hello world!" The @app.route line above the function is called a decorator. Decorators modify the function that follows it. In this case, the decorator tells Flask which URL will trigger the home() function. 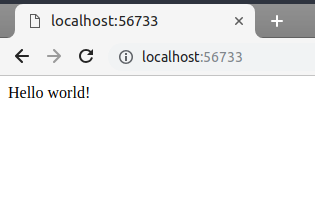 The hello world text returned by the home function will be displayed to the user on the browser. With the views.py file in place, you’re ready to create the uwsgi.ini file. This file will contain the uWSGI configurations for our application. uWSGI is a deployment option for Nginx that is both a protocol and an application server; the application server can serve uWSGI, FastCGI, and HTTP protocols. This code defines the module that the Flask application will be served from. In this case, this is the main.py file, referenced here as main. The callable option instructs uWSGI to use the app instance exported by the main application. The master option allows your application to keep running, so there is little downtime even when reloading the entire application. Next, create the main.py file, which is the entry point to the application. The entry point instructs uWSGI on how to interact with the application. Next, copy and paste the following into the file. This imports the Flask instance named app from the application package that was previously created. This specifies the version of Flask to be installed. At the time of writing this tutorial, 1.0.2 is the latest Flask version. You can check for updates at the official website for Flask. Save and close the file. You have successfully set up your Flask application and are ready to set up Docker. In this step you will create two files, Dockerfile and start.sh, to create your Docker deployment. The Dockerfile is a text document that contains the commands used to assemble the image. The start.sh file is a shell script that will build an image and create a container from the Dockerfile. Next, add your desired configuration to the Dockerfile. These commands specify how the image will be built, and what extra requirements will be included. In this example, the Docker image will be built off an existing image, tiangolo/uwsgi-nginx-flask, which you can find on DockerHub. This particular Docker image is a good choice over others because it supports a wide range of Python versions and OS images. The last two lines will copy the requirements.txt file into the container so that it can be executed, and then parses the requirements.txt file to install the specified dependencies. Save and close the file after adding your configuration. 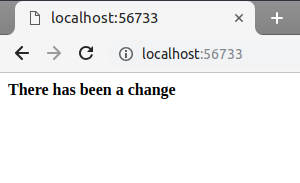 sudo nc localhost 56733 < /dev/null; echo $  ? If the output of the command above is 1, then the port is free and usable. Otherwise, you will need to select a different port to use in your start.sh configuration file. The first line is called a shebang. It specifies that this is a bash file and will be executed as commands. The next line specifies the name you want to give the image and container and saves as a variable named app. The next line instructs Docker to build an image from your Dockerfile located in the current directory. This will create an image called docker.test in this example. The last three lines create a new container named docker.test that is exposed at port 56733. Finally, it links the present directory to the /var/www directory of the container. You use the -d flag to start a container in daemon mode, or as a background process. You include the -p flag to bind a port on the server to a particular port on the Docker container. In this case, you are binding port 56733 to port 80 on the Docker container. The -v flag specifies a Docker volume to mount on the container, and in this case, you are mounting the entire project directory to the /var/www folder on the Docker container. In this step you have successfully deployed your Flask application on Docker. Next, you will use templates to display content to users. Templates are files that display static and dynamic content to users who visit your application. In this step, you will create a HTML template to create a home page for the application. Add the code for your template. This code will create an HTML5 page that contains a title and some text. Save and close the file once you’ve added your template. First, add the following line at the beginning of your file to import the render_template method from Flask. This method parses an HTML file to render a web page to the user. At the end of the file, you will also add a new route to render the template file. This code specifies that users are served the contents of the home.html file whenever they visit the /template route on your application. Visit your application at http://your-ip-address:56733/template to see the new template being served. In this you’ve created a Docker template file to serve visitors on your application. In the next step you will see how the changes you make to your application can take effect without having to restart the Docker container. Sometimes you will need to make changes to the application, whether it is installing new requirements, updating the Docker container, or HTML and logic changes. In this section, you will configure touch-reload to make these changes without needing to restart the Docker container. Python autoreloading watches the entire file system for changes and refreshes the application when it detects a change. Autoreloading is discouraged in production because it can become resource intensive very quickly. In this step, you will use touch-reload to watch for changes to a particular file and reload when the file is updated or replaced. This specifies a file that will be modified to trigger an entire application reload. Once you’ve made the changes, save and close the file. return "<b>There has been a change</b>"
Save and close the file after you’ve made a change. In this step, you set up a touch-reload condition to update your application after making changes. In this tutorial, you created and deployed a Flask application to a Docker container. You also configured touch-reload to refresh your application without needing to restart the container. With your new application on Docker, you can now scale with ease. To learn more about using Docker, check out their official documentation.